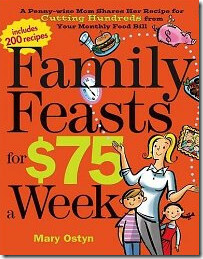 Family Feasts for $75 a Week to the rescue! Written by blogger mom and penny-pincher extraordinaire Mary Ostyn, who prepares three meals a day for her family of 12 for $800 to $900 a month, this book is stuffed to the gills with Mary's expert, in-the-trenches tips on savvy food shopping, plus 200 delicious recipes for homecooked meals that make the most of economical ingredients. Price: List price is $17.95. Can be found up to 40% off on Amazon.